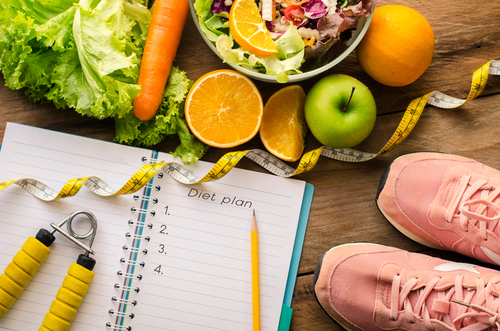 Food, exercise, eating, diet and nutrition- all of these components are necessary for full recovery from an eating disorder. All of these components are also parts of an eating disorder. Eating disorders are progressive mental health conditions in which someone develops an unhealthy obsession with weight, body image, perfection, food, and exercise. Putting energy and focus into these obsessions, people with eating disorders often feel they maintain a portion of control in their lives to compensate for the many areas in which they feel out of control. For recovery from an eating disorder, there is no abstinence other than abstaining from the harmful thought processes, behaviors, and patterns which cause self-harm. Food, exercise, buying clothes, and many other parts of both active eating disorders and eating disorder recovery are tasks of daily living. Recovery from eating disorders is about learning to live life fully, normally, and integratively without participating in harmful behaviors which take away from the ability to do so. Bringing exercise back into life during eating disorder recovery can be scary for both the person in recovery and the family members who are supporting them. An alcoholic cannot integrate consuming alcohol into their life. A drug addict cannot integrate using drugs into their life. Taking physical care of the body is essential for health, wellness, and building confidence. Yet, for the family members, every trip to the gym, every smoothie made in the kitchen, can feel like finding a bottle or a drug hidden away. There is a chronic sense of fear that there could be a relapse which will lead to having to watch a loved one suffer, dive into poor health, and have to start the process of finding treatment again. Warning signs for difficulty exercising during recovery can include very obvious ones and less obvious ones. For example, if there is over-exercising, lying about exercising, or, on the other hand, a total adversity toward exercising, this indicates there are still underlying issues which need sorting. Less obvious might be rationalizing doing exercises which were compulsive during active eating disorder, and hearing regular comments about the amount of exercise, changes in figure, or changes in weight. Encourage your loved one to take it slow and remember its just about moving the body for health, no other goal included. Rather than focus on physical goals like weight gain, weight loss, or muscle definition, focus on creating healthy movement as part of everyday recovery. If going to the gym and being in “exercise-minded” environments is too triggering, it might be better to find alternative forms of movement like dance classes, at home videos, taking long walks, or a more sport-focused workout like going to a rock climbing gym. The most important key in monitoring exercise in eating disorder recovery is communication. You don’t want to impose or inquire, but you don’t want to be uninformed either. Work together to find the healthiest ways to ask how recovery is going and how your loved one is feeling in their exercise routines. Remember, if they are unwilling to talk to you, always encourage them to talk to their therapist or their most trusted contact like a sponsor, a recovery assistant, or a case manager.